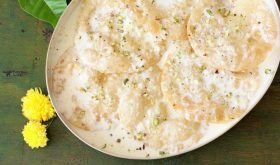 Paal poli is a rich, milk-based, delicious South Indian sweet. It is a special sweet item offered on many a Tamilian wedding menu. I have been fortunate to savor this classic sweet at a friend’s wedding eons ago. 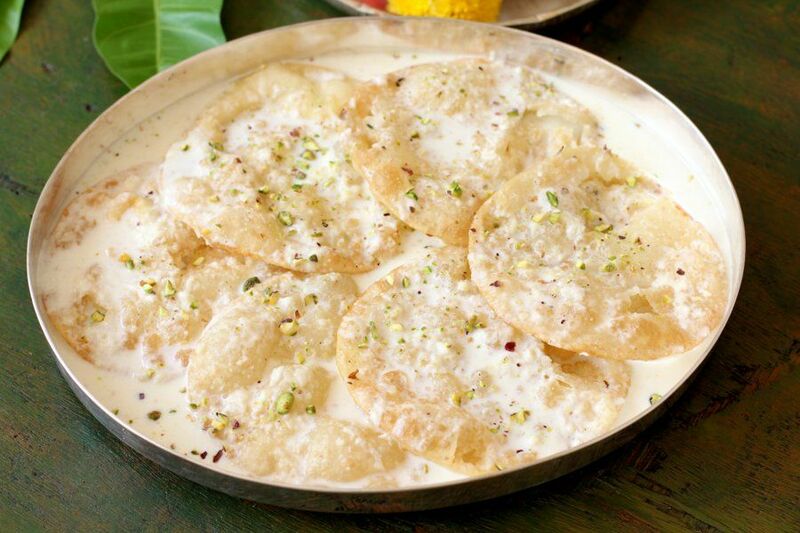 In Tamil Nadu and Karnataka, it goes by different names like paal poori, milk poli, halu obbattu, poori payasa, and halu holige. 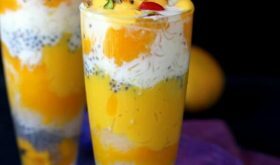 Halu holige is prepared slightly differently from the Tamil Nadu version. In Karnataka, the reduced sweetened milk has poppy seeds or gasagase and fresh coconut instead of milk. I will blog halu holige recipe in the near future. 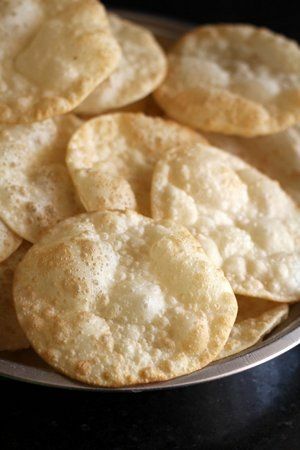 Paal poori is prepared for the Tamil New Year, Ugadi, Bhogi, Avani Avittam and festivals like Krishnashtami, Navratri, and Diwali. 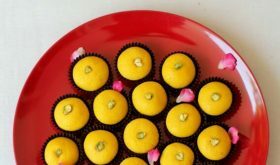 I prepared this delicacy for Diwali this year and it made for a perfect festive sweet. Paal poli recipe though simple to make is slightly labor intensive but definitely worth the effort. 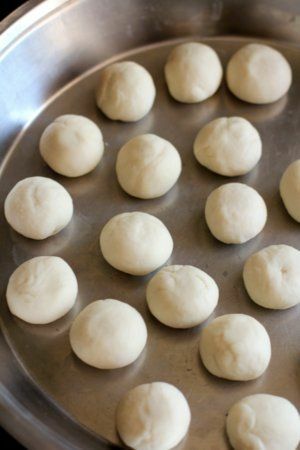 You need to prepare the dough, rest it and roll out lemon sized dough balls into thin concentric circles. The rolled out pooris are deep-fried before dunking them in sweetened reduced milk. The pooris meld in all the aromatic goodness of cinnamon and nutmeg. 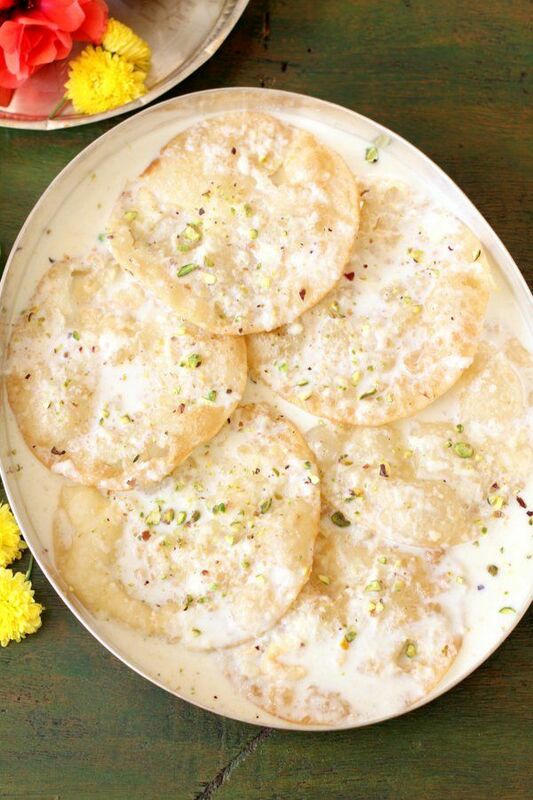 Traditionally, this rich South Indian sweet is made with chiroti rava (very fine semolina). It is also made with a mix of maida or plain flour and sooji or with just plain flour. I have found success when I make the dough with plain flour and fine sooji. The dough should be smooth yet slightly firm like you’d make poori dough. 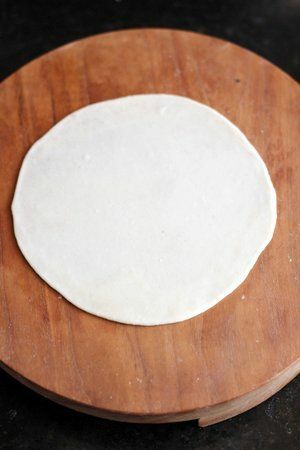 The prepared dough should rest for a few minutes before rolling them into 4″ to 5″ concentric thin circles. The deep-fried pooris should not be too soft or too crisp like a papad. The puris should have a slightly crunchy texture. I recommend you prepare the sweetened milk with full-fat milk. 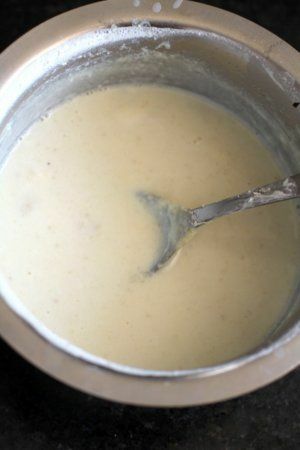 You should simmer the milk and allow it to reduce to three-fourths of its original quantity. 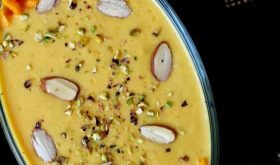 Usually, it is flavored with cardamom and/or nutmeg and saffron. The sweetened milk tastes heavenly with hints of cardamom and nutmeg. 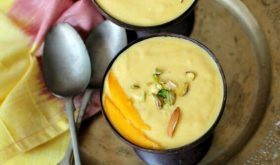 If you do not have the time to reduce the milk, you can make a paste of a few cashew nuts or almonds and add to the simmering milk and sugar mixture. This will thicken the milk slightly and give it a rich flavor. The deep-fried pooris should be dunked in the sweetened reduced milk for a few minutes so that it can soak up the flavors. You can make it ahead of time and refrigerate it until serving time. 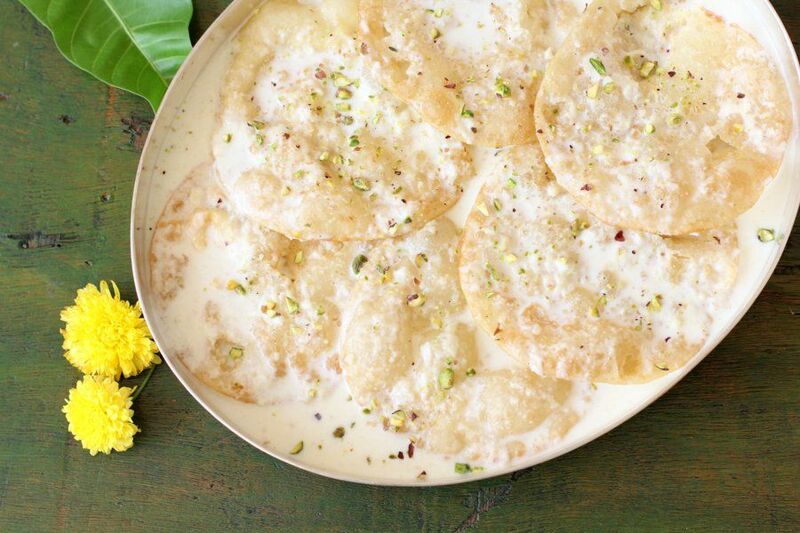 Milk poli is best-served chilled which makes it an absolutely irresistible dessert. Your family especially kids will relish it with joy. Yes, it is a perfect kid-friendly dessert. And do add it to your list of festival food recipes. In a bowl, add maida, semolina, salt, and ghee and mix well. Slowly add the lukewarm water and make a smooth yet slightly firm dough. Rest the dough for 20 mins. Heat a stainless steel vessel and add the milk. Bring the milk to a boil and simmer till it reduces to three fourths of its original quantity. Add sugar and cardamom powder and mix. Simmer for 5 mins and turn off flame. Pour this reduced milk into a wide-mouthed plate. Divide the rested dough into small lemon sized balls. Dust the working surface with flour and roll out thin pooris. Deep fry the oil for frying the pooris. Once the oil is hot, reduce to medium-high and place a poori into the oil. Once it puffs up, flip it gently and allow to cook the other side for a few seconds. Remove with a slotted spoon and place in the reduced milk. Deep fry the remaining pooris and place in the reduced milk. Allow the pooris to soak the flavors for 15 to 20 mins. Garnish with the crushed cashew nuts and pistachios. 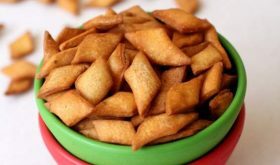 You can also make the dough with chiroti rava instead of a combination of flour and chiroti rava.